Adhering a sheet of patterned paper with torn edges to a background sheet of cardstock is a great way to add texture to your page without cluttering it so you have plenty of room to play with your photos and embellishments. In this layout Susanne shows you how to combine this simple technique with eyelets, brads and stickers. 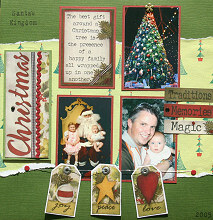 This layout was created using American Traditional Christmas Trees paper, dark green Bazzil cardstock, mid green Bazzill cardstock, deep red cardstock, white cardstock, 3 large silver eyelets, 1 black eyelet, 1 black brad, 1 gold flower brad, 2 MM berry snaps, silver craft wire, deep red ric rac, MM "Rummage" magnetic stamps, black ink and Bo Bunny Our Family Christmas stickers. Cut a piece of American Traditional Christmas Trees paper measuring approximately 23cm by 30cm. Find the centre of the short side. Measure and lightly mark guidelines 10cm in both directions from the centre. Use these guidelines to tear the paper, leaving a piece which will be approx 20cm by 30cm. Adhere torn paper to background dark green Bazzill cardstock. Mat three photos and one Bo Bunny quote sticker with deep red cardstock. Attach to layout as shown. Adhere deep red ric rac over the printed ribbon on the Christmas title sticker. Punch a hole and attach a black brad to dot in the letter "i". Mat sticker with mid green Bazzill cardstock. Adhere with Magic Mount to the left side of your layout, as shown above. Mat the three tag stickers with white cardstock. (You may wish to use the back of the tags for journaling). Set a large silver eyelet on each tag. Punch two holes in base approx 7cm from bottom of the layout and 3cm from either side. Thread craft wire through the eyelets in each tag and through the holes in the layout. Working from the back of layout adjust the tension of the wire so as not to buckle the layout but so the tags have a little movement. Hold wire in place on the back of the layout with supertape. Set two berry snaps into punched holes to hold wire in place from the front. Arrange the tags along the wire as desired. Adhere three word stickers to right side of the page, as shown above. Set a black eyelet on the left side of the "Memories" sticker. Punch a hole and decorate the top of the Christmas tree in the photo with a gold star or flower brad. Finally, stamp small title and date on your layout as shown.